This is volume 1 of 6 volumes. 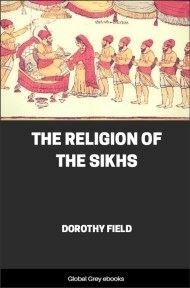 This is one of the first (and still one of the few) comprehensive books about the Sikh religion in the English language. 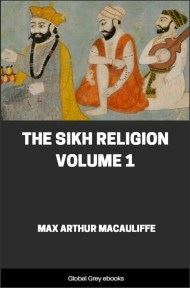 MacAuliffe had extensive access to manuscripts of the Sikh sacred writings (the Granth), as well as support from Sikh scholars and leaders of the time. 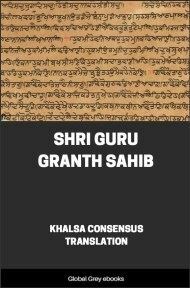 This volume covers Guru Nanak, the founder of Sikhism. To recapitulate what has been more fully stated in the Introduction, Guru Nanak, the founder of the Sikh religion, was born, according to all ancient Sikh records, in the early morning of the third day of the light half of the month of Baisakh (April-May) in the year A.D. 1469; but for convenience sake his anniversary is now observed by the Sikhs on the occasion of the full moon in the month of Kartik (October-November). 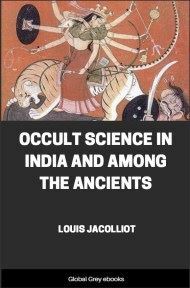 His father, who was called Kalu, was accountant in the village of Talwandi in the present Lahore District of the Panjab, and his mother was Tripta, memorable in Sikh writings for her devotion to her son. The Sikh biographers recount in minute detail all the circumstances of the birth of Guru Nanak. Daulatan, a midwife, assisted on the occasion. 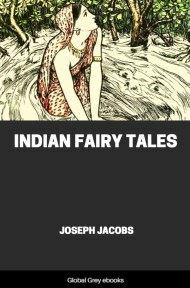 When next morning interrogated by the astrologer Hardial, who came to write the child's horoscope, as to the nature of the voice uttered by him at birth, she said it was as the laughing voice of a wise man joining a social gathering; and she expressed herself at her wits' end to comprehend the child's nature. The astrologer desired to see him, but his mother refused owing to the chillness of the weather. He pressed the matter, and the child was brought to him in his swaddling clothes. The astrologer on seeing the infant is said to have worshipped him with clasped hands. He declared the child should wear the umbrella, the symbol of regal or prophetic dignity in the East. At the same time he regretted that he should never live to see young Nanak's eminence, worshipped as he should be alike by Hindus and Musalmans, and not merely by Hindus as in the previous human manifestations of the Creator. The child's name should resound both in earth and heaven. Inanimate nature should cry out 'Nanak, Nanak!' He should have power over matter so as to traverse unscathed the depths of the ocean. He should worship and acknowledge but one God, and the creature he should treat as a creature. In other words he should be a monotheist, not a worshipper of minor deities and idols. At the unripe age of five years Nanak is said to have begun to talk of divine subjects, and to have fully understood the meaning of his language. Great trust was reposed in him; and both Hindus and Musalmans lavished on him. their characteristic language of religious adulation. At Nankana every place with which Nanak had any association is deemed sacred. On the spot where he used to play with children of his own age and subsequently spend nights in devotion, there was a small tank constructed by Rai Bular, the landlord of the village, in affectionate remembrance of the childhood of the Guru, at a time when his fame had extended far and wide. The tank was greatly enlarged by Kaura Mal, the Diwan or financial minister of Zakaria Khan, who was satrap of Lahore. Kaura Mal was an enthusiastic admirer of Guru Nanak, and lent his great material and political influence to the amelioration of the condition of the Sikhs. The spot is called Balkrira or the child's playground. When Nanak was seven years of age, his father in the manner of Hindus asked the village astrologer to select an auspicious time for the commencement of the boy's education. The schoolmaster thought the time had arrived. The school appears to have been a humble one, and the tuition fees not exorbitant. Kalu's wife and not, as in modern times, the village moneylender was the custodian of the wealth of the house. Kalu took from her a coin corresponding to three farthings of English money, some betel-nut, and rice, and presented them to the schoolmaster with his son. In India wooden tablets painted black are employed in teaching children the letters of their language. The schoolmaster writes the letters with a kind of liquid chalk on the tablet; and the children repeat their names aloud with much noise and energy. The schoolmaster wrote the alphabet for Nanak, and the latter copied it from memory after one day. It is said that on that occasion the young Guru made an acrostic on his alphabet. As in similar compositions in other languages, the letters were taken consecutively, and words whose initials they formed were employed to give metrical expression to the Guru's divine aspirations, his tenets, and his admiration of the attributes of the Creator. S. The one Lord who created the world is the Lord of all. I. The Primal Being is the Giver; He alone is true. U. Praise Him whose limit cannot be found. N. He who knoweth divine knowledge is the learned pandit.